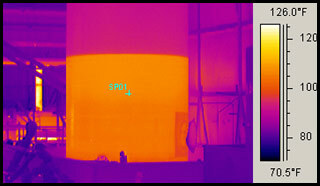 Infrared Thermography is a SAFE and effective way to verify, or check acid tank levels. Infrared can also be used on various other liquid, and solids tanks. Thermal imaging could also be a valuable tool in commercial accidents to determine tank levels during the recovery process of roll over tankers and train derailments. Sediment level mapping within tanks and separators is an extremely powerful technique requiring expertise, experience and highly sophisticated equipment. We regularly survey vessels and map the sediment levels to allow cleaning exercises to be planned and accurately costed.